Lausanne (SUI), 10 December 2012 – Anna Cavallaro (ITA) and Lukas Klouda (CZE), winners of the opening leg of the FEI World Cup Vaulting 2012/2013 series in Munich, both made it a double by claiming a second leg win in Salzburg (AUT) at the weekend. The vaulters, both 28 years old, treated spectators at the Pappas Amadeus Horse Indoors event to dazzling freestyle-to-music rounds and their wins were greeted with great enthusiasm by the crowd. Italy’s eight-time national champion Anna Cavallaro and her 19-year-old training partner Silvia Stopazzini, Junior Champion in 2011, repeated their one-two finish from Munich at the second leg of this prestigious series with outstanding performances. Silvia Stopazzini led the field after the first round with 8,819 points, 60 points clear of Anna Cavallaro. But in the second round, Cavallaro convinced the judges with her complex gymnastic moves on the 15-year-old Harley, lunged by Nelson Vidoni, to Luciano Pavarotti’s “Time to Say Goodbye”, completing with the winning score of 8,785 points. Silvia Stopazzini, disappointed by her small mistakes in the second round, was thrilled to be competing in Salzburg. 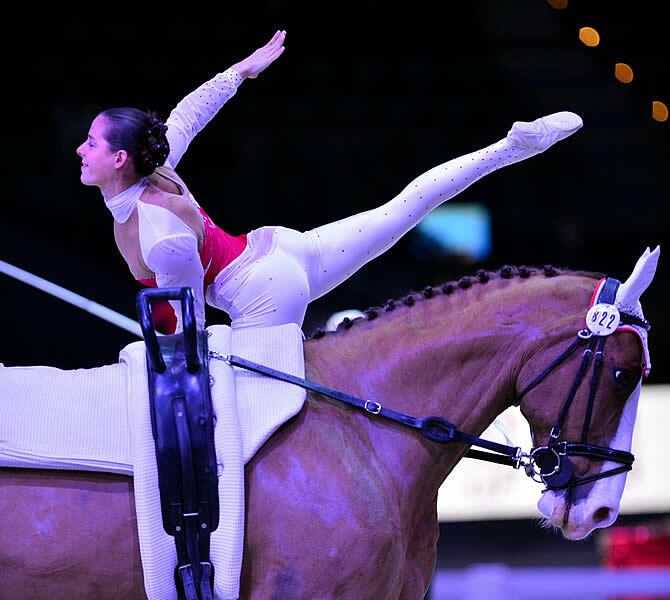 “This never happens in my training, but I’m so happy to be part of the FEI World Cup Vaulting series,” she said. Switzerland’s Simone Jäiser on Luk, lunged by her mother Rita Blieske, took third place with 8,210 points and Germany’s Regina Burgmayr secured fourth place on Cappucino, lunged by Alexander Hartl, with 7,934 points. Cologne-based Lukas Klouda secured a 212-point-lead with Radix SB, lunged by Maria Imhäuser, to collect a total score of 8,489 points and claim victory ahead of Germany’s Victor Brüsewitz. Germany’s Torben Jacobs from Cologne secured third place, also on Radix SB, scoring 8,128 points, with Switzerland’s Lucas Heppler on Aron von Eichhof, lunged by Vanessa Rusca, taking fourth place on 7,999 points. For further information on the FEI World Cup Vaulting series, please visit the FEI World Cup Vaulting hub here.